The Library has some new American Girl Dolls that you can borrow. Meet Logan and Luciana! We also have two new Bitty Babies available for check out as well! Reserve American Girl Dolls today through our online catalog. Each American Girl Doll comes in a case for easy transport. 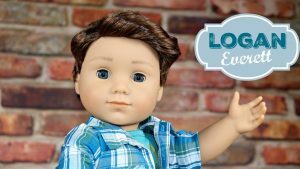 Accompanying the doll will be a hairbrush, some informational flyers, an American Girl Book, clothes, bedding, and a notebook for your child to write their fun adventures with the American Girl Doll down in. Provided through the Allegheny County Library Association. 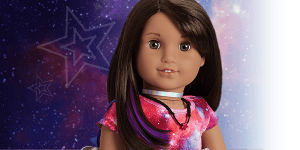 American Girl Dolls checkout for one week. Logan is a new dummer who often performs alongside Tenney Grant. Logan is the lone boy among all the American Girl Dolls.